In the paradise of Tamoanchan, the gods looked at the newly formed, but weak, humans and said to each other, "What shall the humans eat? Everyone must look for food for them". 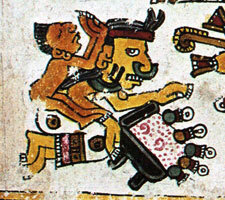 The red ant brought forth some corn kernels from within the Mountain of Our Sustenance, also known as Tonacatépetl. 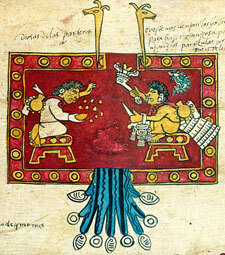 It offered the corn to the humans and Quetzalcóatl saw this. He asked "Where did you get it?" The ant did not want to say and refused to do so for a long time. 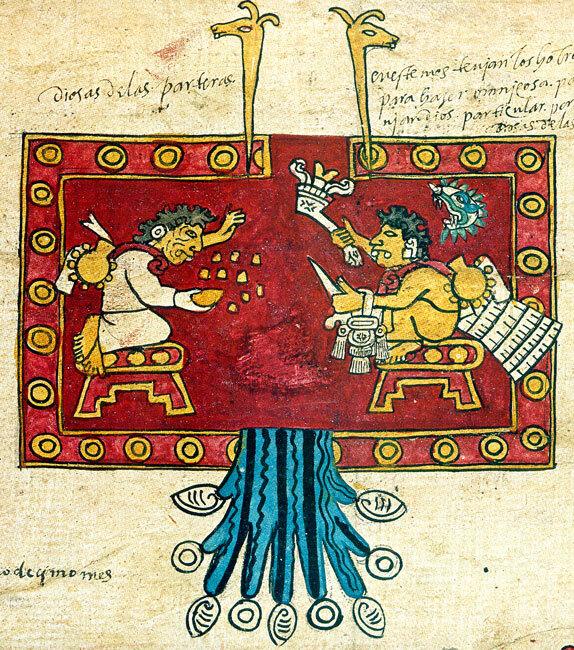 Nevertheless, it eventually succumbed to pressure and told Quetzalcóatl that Tonacatépetl contained the corn. Quetzalcóatl then became a black ant and went inside this hill, Mountain of Our Sustenance. He collected some corn and returned to Tamoanchan where the gods chewed on it immediately. The paste from the chewed corn was then placed on the lips of the humans and they began to stir and become stronger. 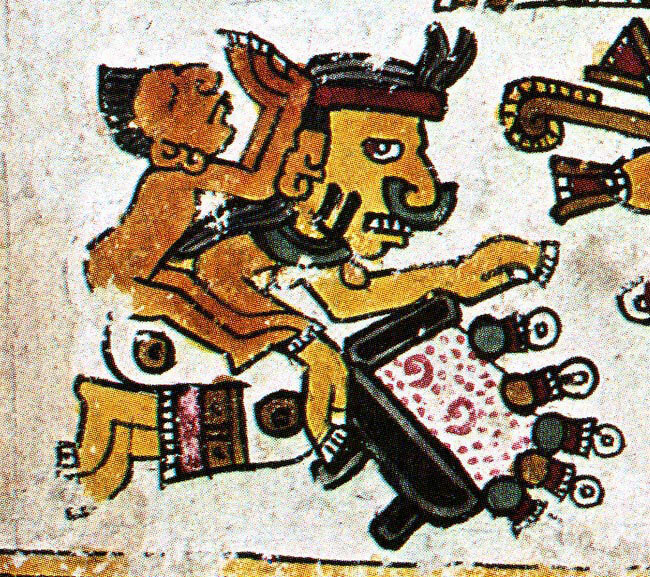 Then the gods said, “What should we do about the Mountain of our Sustenance, Tonacatepetl?” Quetzalcóatl set off, determined to tie up the mountain with ropes and drag it to Tamoanchan, but, try as he might, the mountain would not budge. 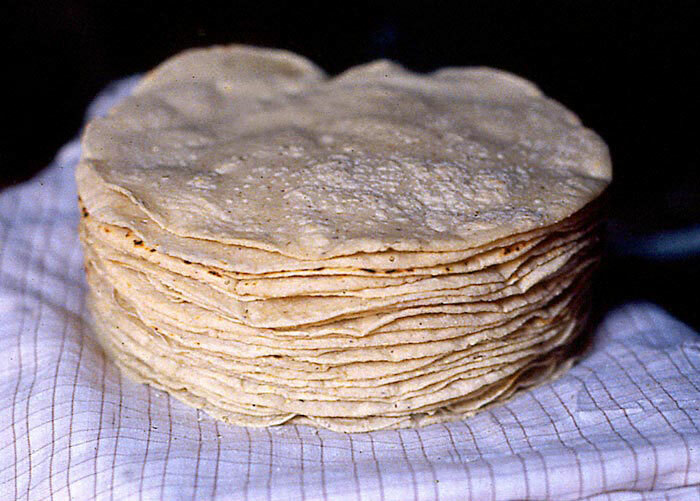 Then the two gods Oxomoco and Cipactonal threw lots with grains of corn so they could divine what next to do. They said, “Only the god Nanáhuatl can get the grain out of the mountain. He must split it open with his stick.” The gods of the rain, the Tlaloques, helped Nanáhuatl. These four gods were coloured blue, white, yellow and red. As he split open the Mountain of Our Sustenance, the kernels of corn were swept away by the Tlaloques. 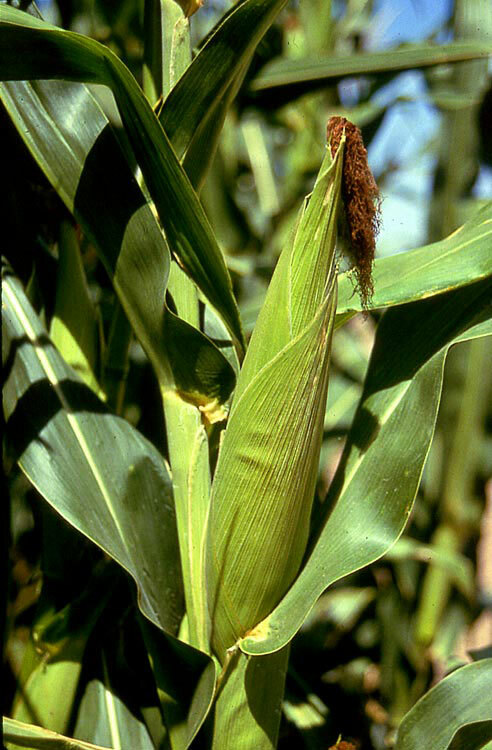 The corn kernels adopted their colours: blue, white, yellow and red. The Tlaloques also took beans, chía, amaranth and fish amaranth with them. Everything was swept from inside the Mountain of Our Sustenance. This passage outlines the events that passed in order to give humans nutrition, as well as to detail the discovery of the existence of corn. It’s based on the Legend of the Suns, a 16th century Nahua document. The myth that you have just read came from the Nahua region in central Mexico. 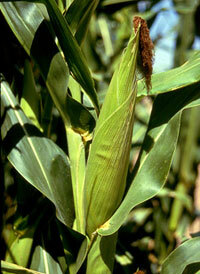 Many versions of the discovery of corn have cropped up throughout the Mesoamerica, especially the Maya region. These stories are similar and centre on the gods’ search for the ideal food to give to humankind. 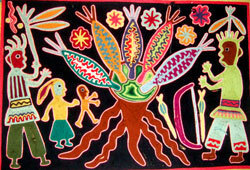 Alfredo López Austin explains to us that this same myth can be found over such a large geographical area because it is part of a Mesoamerican tradition - not uniquely Aztec nor Maya - that had strong cultural traits from as far north as the modern day states of Baja California and Chihuahua down to El Salvador and Honduras. 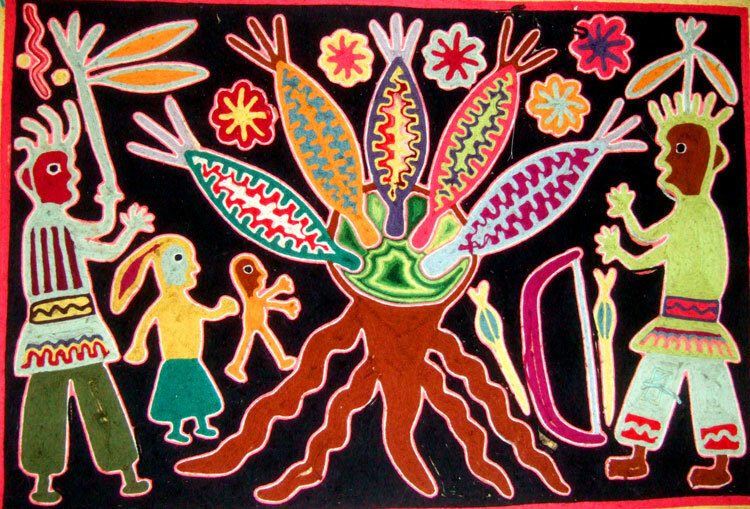 The immense territory that formed Mesoamerica was a place of constant interaction between cultures and peoples. It became the seat of a strong, wide-placed native tradition. The Virgin Mary was sitting on a stone suckling her baby, Jesus Christ. She was thoughtful, worrying about how she would sustain herself and her son. All of a sudden she noticed a movement under her stone. She saw that there were ants carrying something that neither she, nor any human, had seen before. She asked herself what it could be, and soon discovered it was corn. She caught one of the ants and asked it to tell her from whence it had obtained the corn, but the ant would not obey her and refused to say. Consequently, the Virgin Mary announced that the ant would be sentenced to death if it did not obey her, but even then it would not say where it found the corn. She took a piece of twine and tied it around the ant’s waist and tightened it little by little but it still refused to tell her. Finally, when it felt death was imminent, it revealed its secret: the corn could be found through the fissure in a mountain that nobody but ants could fit into. When the Virgin ate the corn she felt queasy, it didn’t do her any good. She sat on her stone once more and a thought occurred: “What if I use this stone to make lime to cook the corn with? Then it will be better for me”. She did this. As for the twine with which the ant was suffocated, it is now used as material to make nets for collecting corn cobs during harvest. • Del Paso y Troncoso, Francisco (translator), Leyenda de los Soles: continuada con otras leyendas y noticias. Relación anónima Escrita en Lengua Mexicana el año 1558. Biblioteca Náhuatl Vol.V - Tradiciones Migraciones (cuaderno 1), 1903, Florence, Italy. 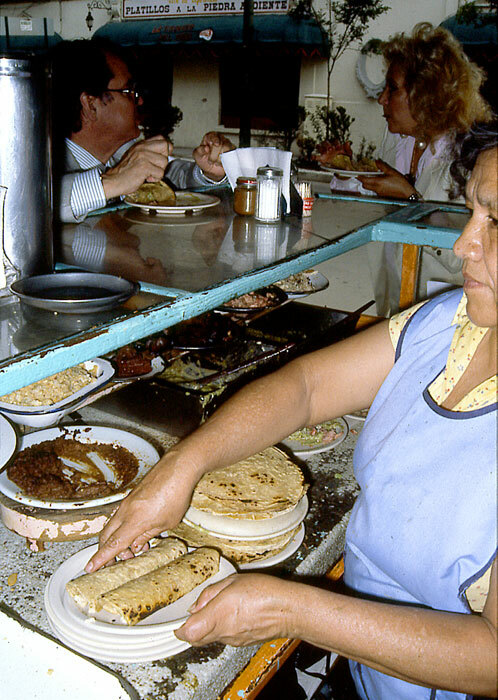 • López Austin, Alfredo. Tamoanchan Tlalocan: Places of Mist. Translated by Bernard R. Ortiz de Montellano and Thelma Ortiz de Montellano, University Press of Colorado, 1994, Colorado, USA. • ‘Del elemento creador a sustento vital: el maíz en los mitos mesoamericanos’. Tomás Pérez Suárez, Arqueología Mexicana Vol. V, Number 25, 1997, Mexico City, Mexico. • Pic 7: photo by Sean Sprague/Mexicolore. When was this story written, published, or put on the web. I’m trying to cite it SAA style. Mexicolore replies: This article was uploaded to the site on January 15th. 2008. Hope this helps.